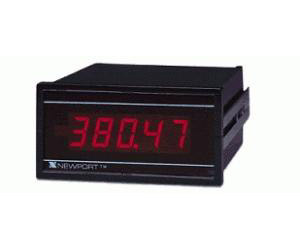 Models 2003B and 2004 are high-accuracy AC voltmeters or true-RMS voltmeters. Exceptional noise rejection is provided by a conversion circuit with a crystal oscillator, which is set for either 50 or 50 Hz rejection. Both models are available for voltage or current input and allow special scaling for the output of a 5 A current transformer. A screw-terminal barrier strip for power and signal is standard. All AVG models use a precision op-amp rectifier circuit to provide an economical, high-resolution AC voltmeter, which is calibrated to display the true-RMS value of sinusoidal signals. All RMS models use an integrated circuit that computes the true-root-mean-square value of complex input signals. Screw terminals are provided for AC or DC coupling. AC coupling allows the measurement of the AC component or ripple from a signal with both AC and DC components. DC coupling allows the measurement of true-RMS, including AC and DC components, from DC to over 30 kHz. Maximum crest factor (Vp/Vrms) is 3:1). Non-isolated parallel BCD output is a standard feature and is implemented on the main circuit board. Additional data and control outputs can be provided by an optional upper board.